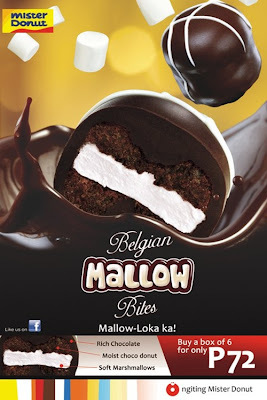 I'm not a big fan of Mister Donut but I like Choco Mallows, so when Mister Donuts came up with Belgian Mallow Bites, I got curious and bought a box. Before leaving the store, I took out a piece and ate it. I found it too sweet. I took the mallow bites home and placed them inside the fridge. The following morning, I had two for breakfast (yeah, I know, very healthy breakfast haha). I found out that when chilled, the mallow bites weren't so sweet. They went great with coffee btw. Mister Donut's Belgian Mallow Bites are dense, probably because of the donut part. While I could eat a pack of regular choco mallows in one sitting, I was already full after eating two of Mister Donut's.